Landing a "dream job" after graduation is rare and certainly not easy. 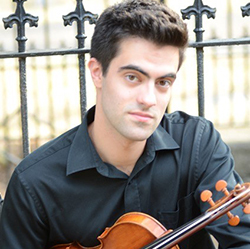 Few, but exceptional graduates land premier positions, but that's just what happened to Philip Manning, a 24-year old violinist who recently finished his graduate studies in Duquesne's Mary Pappert School of Music. Manning received two job offers, both as First Violinist in two different cities of his home country, Canada. The Calgary Philharmonic Orchestra offered him a job in April and in May, Victoria Symphony followed suit. A native of British Columbia, Philip accepted the latter, where the first concert of the summer season is July 20. "To get an audition for a major symphony orchestra anywhere in North America or Europe on a first try is really unusual," says Charles Stegeman, Manning's violin professor at Duquesne. "Normally, you get it after several attempts. The fact that he got two in a row is just staggering." Philip believes that his time at Duquesne helped elevate him from student to professional status. Says Manning, "In a nutshell, I learned what it took to make it in the real world-which is lots of hard work, professionalism, and maturity. [In my program], I gained the ability to approach a piece of music in a logical manner, making it less daunting and easier to understand. My experience in graduate school allowed me to learn how to work well with other musicians, on both a musical and personal level. General technical prowess is simply a by-product of all the work." The music program's structure is very focused and Philip found his teachers, Charles and Rachel Stegeman, very helpful in reaching the specific goal he set--to obtain a professional orchestra position. Manning refers to Charles and Rachel as "stars," always willing to make extra time for him and pushing him to play and perform to the best of his ability: "They geared everything towards the goal of me becoming a professional, which meant playing in front of classmates for long periods of time without breaks and focusing exclusively on the repertoire required for auditions. Being in the student orchestra was very helpful as well, not just for the wonderful experience of working with all the other musicians and our conductor (Jeffery Turner). The repertoire we played was very challenging and reminiscent of a professional setting." Philip considers his time in graduate school an adventure. "Coming all the way from the West Coast of Canada to Pittsburgh, I appreciated being in such a friendly, encouraging atmosphere."